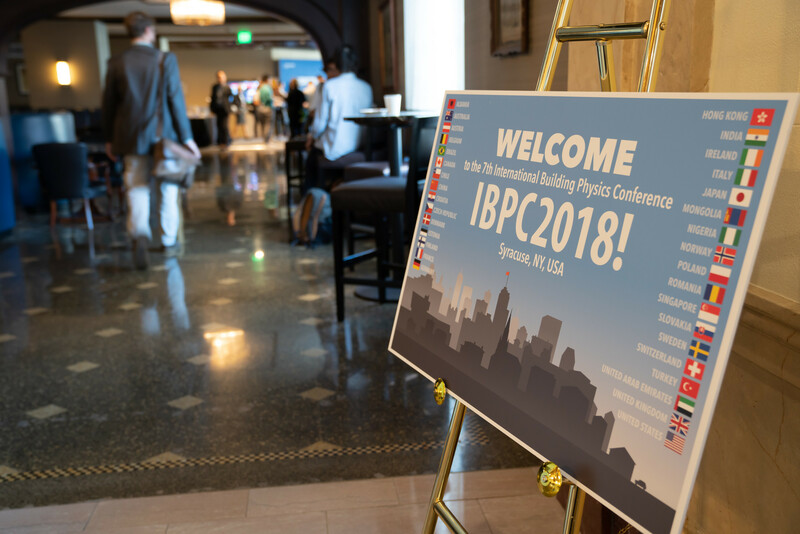 Experts on the science and engineering of buildings and urban environments will convene in Syracuse, NY September 23 to 26, for the 7th International Building Physics Conference (IBPC). More than 300 attendees from 33 countries will gather to present original research and findings, demonstrate and exhibit innovative green building technologies, and discuss future challenges and opportunities. The theme of the conference is “Healthy, Intelligent, and Resilient Buildings and Urban Environments.” The conference program includes six keynote presentations, more than 250 podium and poster presentations, workshops, networking, and more. Syracuse was selected as the host city for the IBPC2018 based on Syracuse University’s exceptional research and teaching strengths in multiple areas, including energy and environmental systems, healthy and equitable communities, and innovation and entrepreneurship. The conference is jointly organized by the Syracuse Center of Excellence in Environmental and Energy Systems (SyracuseCoE), Syracuse University’s College of Engineering and Computer Science, and the Syracuse University School of Architecture. The conference, to be held September 23rd – 26th at the Marriott Downtown Syracuse (formerly the Hotel Syracuse), will cover a wide range of research topics cutting across multiple scales of built environmental systems ranging from nano-material applications, to microenvironments around occupants, to rooms and whole buildings, and neighborhood and urban scales. The goal of the conference is to advance the collective understanding of the nature and behavior of the cyber-physical systems in these different scales, how they interact, and what can be done to optimize their design and operation for healthy, intelligent and resilient buildings and urban environments. For more information on the conference, including an overview program, visit the IBPC2018 website.